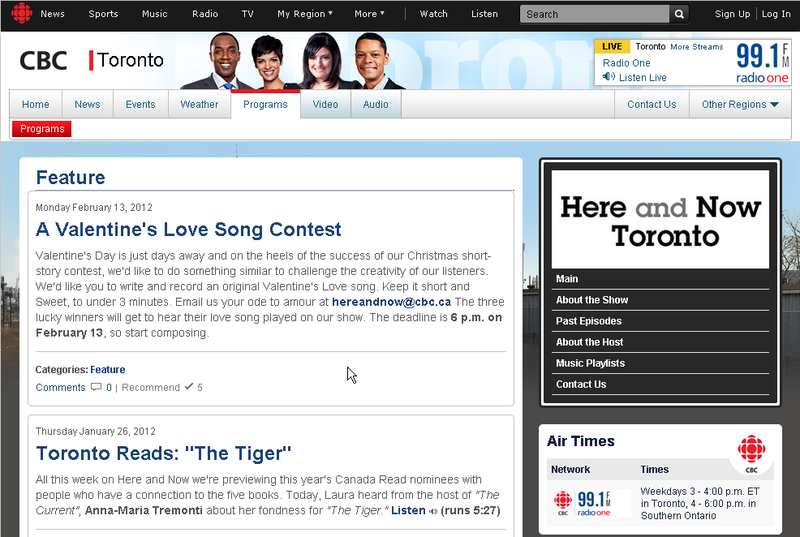 We Got Played on CBC Radio! Huzzah! 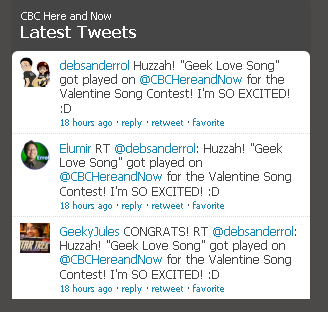 Errol: CBC Radio, Here and Now had a Valentine Love Song Contest, and on a whim, I sent Geek Love Song (the one off of the upcoming CD) in! And it won third place! HUZZAH! 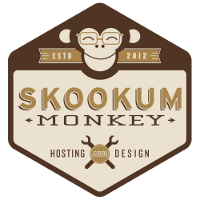 This is a triumph for geeks everywhere! I honestly didn’t think it would get picked, and for that matter, forgot about it until I received the email. Only thing is, I was late! I didn’t get to hear it! Stay tuned, because when that archive is up, I’m downloading that sucker! Update 3: Hey! I found the person who won 2nd place in the contest! Huzzah! His name is Darin Martin. He has a blog on blogger, and I tried leaving a comment twice, and I think I failed both times. So just in case it now looks like I’m some crazed comment stalker, I just stopped trying. 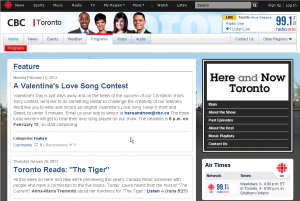 21 Responses to We Got Played on CBC Radio! Huzzah! Again, congrats :). The all caps talk was hilarious. Now maybe we can convince you you’re talented :P.
@Manda, I have many talents! I can eat more rice than you! Do you guys know who got 1st and 2nd? I missed the show but really was hoping to find out. I heard 2nd place, but had to leave before 1st place came on. 😀 Let me do some google searching. @Errol, have they posted any of the audio archives yet? @Errol, we must find that ONE person on the internet who archives EVERY SINGLE STREAM of live data. There is always someone. @Errol, buy? how does one buy an episode? Like, full rights or just the copy? @Errol, we are now. Also, we seem to be hitting that max threading thingy again. @Errol, Do what you will with it. Just make sure I get copies for Mom and me!!! !